It’s not easy navigating a new home. For the recent influx of refugees from war-torn Syria, it can be challenging to crack the “codes” of working and living in a new country. But computer code is a universal language — one many are eager to learn. 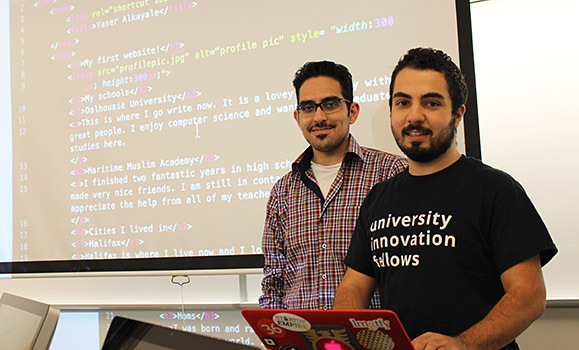 Yaser Alkayale, a third-year Dal CS student from Syria who put the curriculum together, says one of their goals was to invite refugees who may feel uncertain about their place in the school system, and expose them to a taste of what computer science has to offer. The camp was open to individuals hoping to get into university sometime in the near future, and attracted students ranging in age from 12 to 50. 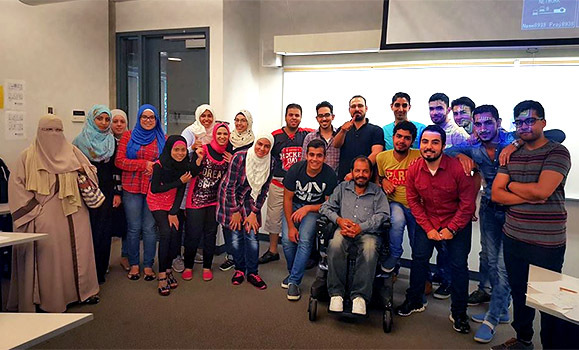 Helping organize the camp was doubly valuable for Zaher, given it was his first time getting exposed to a Canadian classroom experience. The inspiration for the camp came from Computer Science Dean, Andrew Rau-Chaplin, who suggested the idea to Yaser and also donated funds from the Faculty to support it. Yaser says the students have gotten great feedback from participants, with many positive posts and thanks on their Facebook page. Going forward, they’re discussing ways to continue the camp as a once-weekly session, provided they can find the funding and support to do so. “We’d love to expand on it in the future,” says Yaser.